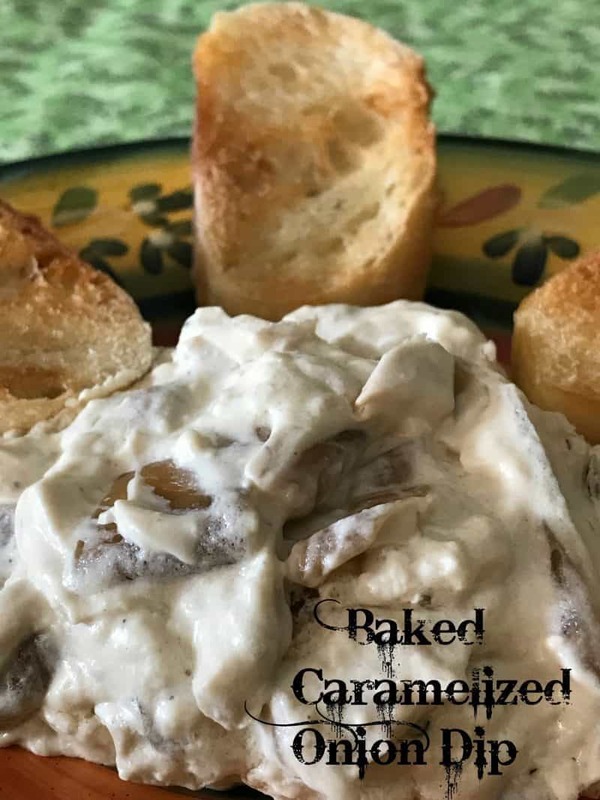 Baked Caramelized Onion Dip is a fantastic “baked” dip with lots of cheesy, creamy, oniony goodness. The cheesy part comes from the Swiss cheese and Parmesan cheese and the creaminess is from a combination of sour cream, mayonnaise and cream cheese. The star of the recipe; caramelized onions. Onions saute’ in melted butter until sweet and golden brown. This recipe calls for using caramelized onions. 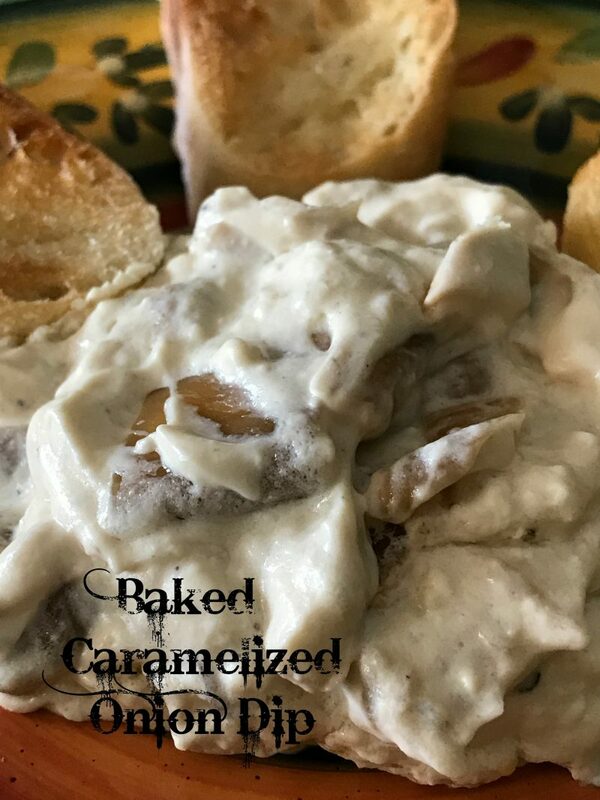 Yesterday I posted a recipe for Slow Cooker Caramelized Onions with this recipe in mind. Making caramelized onions in your slow cooker is fast and easy. The hardest part is slicing all the onions, which really isn’t difficult just alittle ‘tear jerking.’ Once that part is over and done with, you’ll have great tasting caramelized onions and a great smelling house. Serve caramelized onion dip with your favorite pretzels, chips, corn chips or crackers. Our favorite way to serve this warm dip is on lightly toasted baguette slices, with or without an ice cold beer. Since I generally only use sweet onions, such as a Vidalia onion, this recipe was made with sweet onions but you can easily use yellow onions or even a combination of yellow and sweet onions. 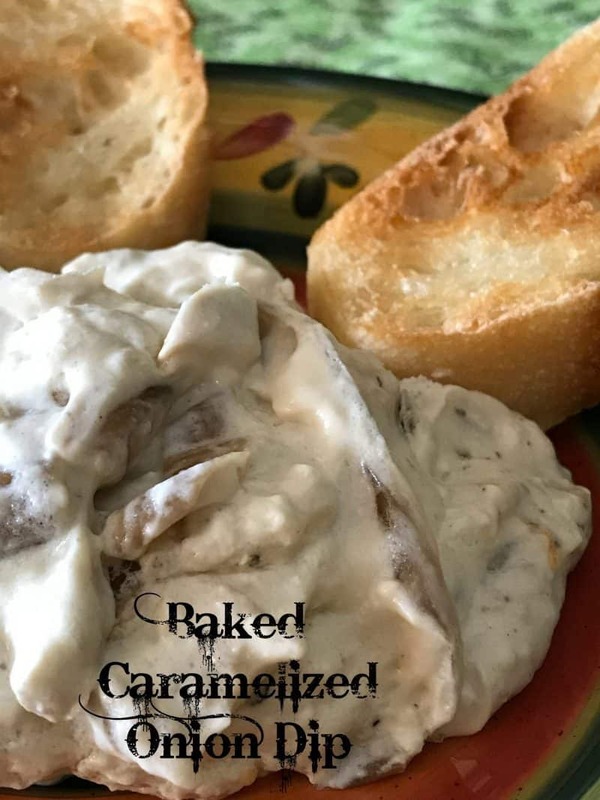 Looking for more “Dip” recipes? Try this recipe for Radish Dip and/or this one for Vampire Dip Let’s Get Cooking! This delicious dip is fast and easy to prepare. This dip will disappear fast. 1/2 cup shredded Parmesan cheese. Cook bacon in a large nonstick skillet. Remove to a paper towel lined plate to cool. Crumble. Add onions and salt to bacon fat in the skillet and cook over medium-high heat for about 5 minutes. Reduce heat to medium and cook, stirring often, until onions turn a deep golden brown color. This can take as long as 20 minutes. If onions start to burn, turn heat down to medium-low. Add wine and cook 1 minute. Stir in tabasco. Remove from heat. Mix together sour cream, cream cheese and mayo in a medium bowl. Add crumbled bacon, Swiss cheese, onion mixture, and black pepper. Mix together well and transfer to a 4-cup baking dish. Sprinkle top with shredded Parmesan cheese.